You are here: Home > (Update) Is This The Samsung Galaxy S III? Will It Be Unveiled May 22nd? (Update) Is This The Samsung Galaxy S III? Will It Be Unveiled May 22nd? Update: Just as many of you suspected, this very well could be a clever fake. 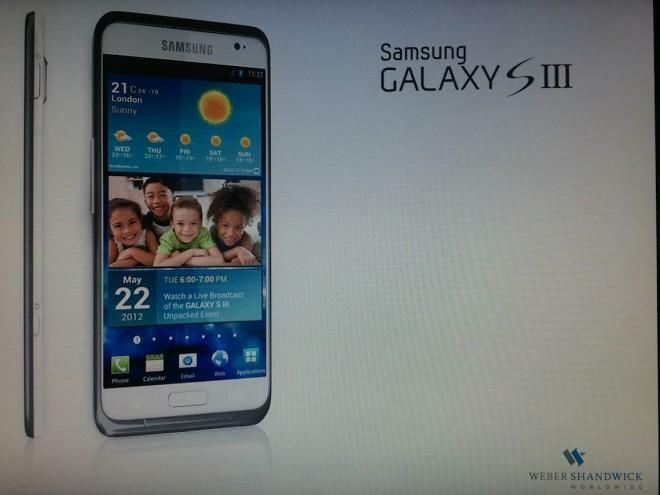 So is this the very first legitimate image we’re seeing of the Galaxy S III? Maybe, no, yes. We honestly don’t know, but it does look more legitimate compared against some of the other rendered images we’ve seen online lately. The screen capture above was discovered on Reddit earlier this morning with almost nothing else, just the image. There wasn’t any supporting information, documentation or anything else that can be verified. Given that, it’s hard to know if this is in fact the real deal. Along with the above image comes a new rumor Samsung is planning to unveil the GSIII on May 22nd, as a tie-in to the Summer Olympics in London where the announcement would take place. Samsung is a big sponsor for the London 2012 games, so that does make some sense. The Weber Shandwick logo found in the bottom right corner of the image belongs to a PR firm, one Samsung may or may not use but it does lend some credit to the image. At this point, everything about this image and the May 22nd date are unconfirmed, though we’re always hopeful. At some point we need to know what the upcoming T-Mobile T999 model is and since we’re still betting it’s the Galaxy S III, we’re eager to find out. Yeah, finally a GS3 phone concept that made me smile. I can confirm that this is the Galaxy S III in the picture (artist representation). ;-) I do hope this is accurate though, because that’s one nice looking phone. Hope the specs line up with the looks as well. how can you confirm? if you Hope??? Yes, how can you confirm? Do tell! ISC Touchwiz 4.0 for the GS2 is leaked out. It’s kinda of a disappointment though. Looks like nothing changed. T999 has to be the gs3. The only question is where do they go from there? Will they adopt global sku numbers? That would make sense with spectrum refarming and all. looks like it takes after the Galaxy Note minus the stylus. until we get more of a answer from samsung of release date, i’ll patiently anticipate this. Why can’t Samsung put the best components in good looking phones? I think it looks ok, now go tell pimpstrong he’s frontin G Dawg cause I know u rep real G’s,now can I get a witness….. I take it back G Dawg, ur right the phone does look ugly. Well as I said a month ago and in here about three weeks prior, I believe the SGS III will be debuting in the UK, at the launch of the Summer Olympics. This “intel” was leaked via marketing discussions in South Korea, so I consider the information the most reliable and credible out there. This time around there may not be the usual marketing authorized leaks that we usually see, such as Mr. Blurry Cam, then a side shot, frontal shot, then specs, and finally a YouTube video.Samsung may want to be like Apple for the SGS III launch. You nailed it “Samsung wants to be like apple” What they need to realize is you have to earn respect through hard work & dedication to build and support the best products, rather than try to ape the best products as cheaply as possible. As to renderings, I remember all the cool, professional, and legitimate looking fake renders of what the new iPhone would be looking like. Now they are doing it with the iPhone 5, some look da#n convincing. Pretty sure the white edge you are pointing to from the side is the back of the phone… If that’s the case…then at least the render is still accurate, you can tell from the camera lens “hump” at the top… whether it is really the S3 or not I suppose still remains to be seen. It looks like a camera button on the side as well… I really hope it is… that is a must these days… a dedicated camera button… and while you are at it… put a dang notification light on these phones!! No, on the front picture it shows the grey being outside of the white and in the side profile the white is outside of the grey. If the side profile was correct then you wouldn’t see any other color but white from the front profile. The side picture shows the back is white. The front bezel should be what it is, so.the render is accurate. How is it wrong ? In the front pic you can tell the front is black and back is white, the render is right, as Mark Caswell said you can tell by the camera hump on the side picture the back is white and front black also thats the way Samsung phones are, camera and power button on the right side. whats your comeback? Clearly you don’t know what you are talking about…. What I don’t understand is why it looks like there is a speaker grill on the bottom of the phone but not the top? what the first arrow is pointing to is the back of the phone. notice the little hump that sticks out…that’s the camera. I agree, also that looks like the power button at the same level as the camera. It seems as though few phones have the power button on the left side of the phone. It’s usually on the top or the upper right hand side(like this one). this could be real. I don’t understand the speaker grill at the bottom. So, what you have are two photos, one of the front and the other of the right hand side. I’m used to seeing one of the front and one of the left hand side, probably like most other people as well. Hope this isn’t what it really looks like. I dont see why not. see the arrow is pointing at the back which is white and the front metallic. they match, and you got it wrong. If Samsung keeps their usual plasticity on this one I will skip again. I refuse to pay $600 for a device that is not that premium. get some materials together and come up with the real no more toys! If they decide to go with the premium, yes I will buy. When I get my hands on the next nexus,iphone 5 and SIII I will make my decision. Yes they match… Open your eyes people! The screen on the slim pic is faceing left, the backplate is white, they do match. Look closer. T999…i would say 80% Samsung GS3 and 20% Tmo GNex. If the face of the device actually looks like the above image i will be disappointed. There was a porported image of a GS3 that appeared in a Samsung promotional video some time back at CES…that is what i expect the actual GS3 to look like or close to it. If you would actually look close at the pic its in the same area on the bezel as the bottom grill. of course this is fake, there is no ear piece, and since this is white, you should be able to see it easily. To all those saying Fake… Listen, this is no fake. Check this link for better pic. The ear piece is in between the white and black border on the top. The back is white. Don’t act stupid. I will come back on this forum after it is released to see who is right. All those people saying this is FAKE got it wrong, including David… Sorry David.. If this is real I am guessing they are going with a non removable battery like Apple and HTC. I really hope not… but being so thin that is my guess. I’m calling fake here. Where are the back/menu/home haptic buttons? Also, why would they put a trackpad on it when that has been proven useless on so many models? If this ISN’T fake, it’s a huge disappointment. Nevermind. Just looked at a Galaxy Note, which I would take any day of the week over this phone, but the design is consistent and I guess the haptic buttons aren’t necessary. Since David is slow on this site, here is another “Rumored” leak of the Galaxy S3. I really don’t believe I’m slow, but since I run the site by myself and it’s the weekend, I’m enjoying a little “me” time. Thanks. Samsung added some bezel styling to their tablets to sidestep Apple’s patents. If this is real, I would expect the same for their phones. That looks more realistic. The article pic looks stupidly thin. I agree with BahamasGeek, that’s why I hope more phones become pentaband so that we can buy them at any time from anywhere and choose which provider to go with. this would take to long to render if fake. That’s it alright… the new picture posted is not though. You know, I’m starting to think the t999 might actually be the S3. With all the rumors of samsung having sent out test units already to carriers…I bet they’re trying to pull off an apple. Big announcement May 3, and then huge release everywhere a few weeks later. None of this 6 months later nonsense.